On this page you'll find all sorts of stuff you can print out yourself—to cut, craft, draw or color. And it's all free! Use it at home, in your classroom, anywhere you like. It's all just for the fun of it! To help celebrate the release of my new non-fiction graphic novel (with writer Sara Latta) the publisher, Lerner Books, has sent me a PDF of some cool bookmarks they'll be producing for me to give out at school visits. If I don't make it to your school you can still make your own version of the bookmark by clicking the image to the right and then printing and cutting out your own SMASH! bookmark. Enjoy! 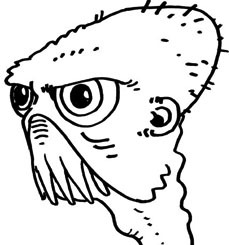 Here's your chance to play Dr. Frankenstein: click the creepy guy at right to open a page of printable monster parts you can mix, match and color however you like. Cut out your favorite pieces—assemble arms, legs, bodies, and heads however you like—then tape those parts together to create your own personal abomination! IT'S ALIVE! 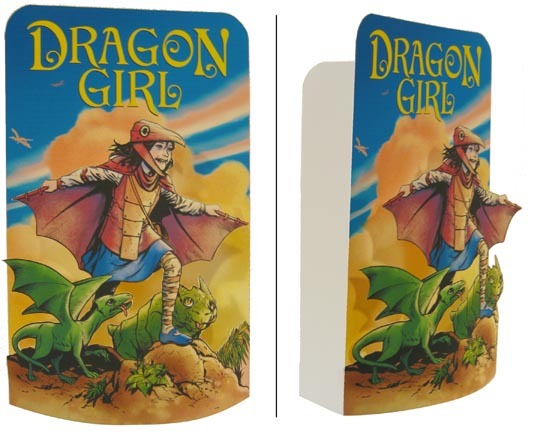 Now you can create your own 3D cutout diorama of Alanna and Griffin (from the graphic novel Dragon Girl). Click the image at right to go to art and instruction pages that you can print out at home to create your very own 3D Dragon Girl and friends! 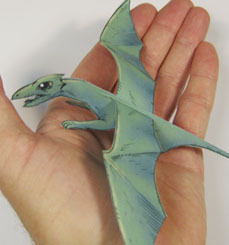 Now you can create your own 3D cutout version of Griffin (from the graphic novel Dragon Girl). Click the image at right to go to an art and instruction page you can print out at home to create your very own baby dragon! See those two light gray, featureless figures at right, the ones that look like they could leap into action to protect the world from evil, if only they had some clothes and superpowers? Well now whether or not they get those things is up to you! These are the starter sketches I provide to kids who attend the character design workshops I hold from time to time at schools and libraries. At these events I help kids design their own superheroes, but not everybody with a great idea for a superhero is a great artist (yet!) so I give them a head start on the drawing part of the job by handing out these lightly printed sketches. They can draw right over my figures, adding the masks, capes, laser cannons, rocket boots, etc., that they imagine without worrying about how to render tricky details like hands and muscles. Alanna the Dragon Girl and her pet dragon, Griffin, certainly lead colorful lives. Here's your chance to decide just how colorful— by printing black and white art of these adventurous pals and adding the color yourself! Clicking on the picture at right will take you to a full-sized image of Alanna and Griffin that you can print on your home or school printer. 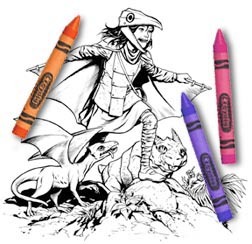 Then get your crayons or markers and add a little color to their lives. (If you'd like to see how I colored the duo you can look here, but don't let my version tie you down—how do you think they should look? Jeff Weigel | 113 Villa Drive | Belleville, IL 62223 | 618-791-9005 | jeffweigel@charter.net | All artwork, text and design ©Jeff Weigel and may not be used without permission.